I have been reading scholarship on the historicity of Jesus and the critical Gospels and writings that make up the New testament for years and am quite familiar with the corpus. This book is an excellent review of the extant corpus which has emerged through the last two centuries and does the added service of capturing recent work which has nicely restored the importance and also the timeliness of the New Testament in terms of events that took place. A number of statements can be made. 1 The resurrection may well have been physical if we accept the evidence of the Turin shroud as per last ignored scientific analysis which established an impossible scanning process by present standards congruent with reanimation by a spirit body. 2 Regardless the spirit at the least appeared strongly to any number of the disciples in a way congruent to present experiences with certain spiritual masters after the purported resurrection. This conforms to Jesus surviving as a living master. 3 This spiritual gift of complete belief allowed the Jesus Movement to explode within the jewish community within the first two to three years of the resurrection providing a large nuclear population which was also quickly unsuccessfully suppressed by the temple. 4 In terms of the fate of Jesus, it was possible for Jesus to escape provided he recovered from the ordeal of the Crucifixion in terms of the fact pattern. As a spiritual master, he would retain the capacity to communicate mind to mind with his disciples. All this is known as possible and happens to this day. 5 Jesus was and is one of the great genius of history regardless. Understanding his thinking and his thought processes is an excellent study in how to launch a social movement that will radically change society. That we live in the outcome blinds us to this. Approaching his work with anything less than the utmost respect is the path of a fool's ego. 6 It follows that the living Jesus also spent physical time with his disciples to properly empower them in terms of their own spiritual gifts. It is from that point that we have his disciples also performing miracles. All this informed the community at large and fueled its rapid growth as a tolerated movement inside the whole Roman Empire. 7 More importantly, it separated itself from the at large Jewish community and leadership then on a collision course with the same empire which they had to lose badly and did. That destruction led the Diaspora of Rabbinical Judaism that we are presently familiar with as a sister movement alongside its vibrant offshoot. It has been the tension between the two that has done the most to preserve so much of scriptural material as we have and of the history and the traditions. Most satisfying is that we find that modern work and archaeology has eliminated the bulk of factual doubt that could be drummed up by any close reading of the gospels themselves and put them to rest. That is a surprise as such evidence is naturally long gone but the same effort that challenged such issues also have resolved them. As a lay apologist, I am always interested in reading on various aspects related to Christian evidence. The various “quests” for the historical Jesus are just one aspect that I enjoy reading about. I saw a new book on the issue, and immediately requested one from Thomas Nelson publishers (through Book Look Bloggers) to read and review. 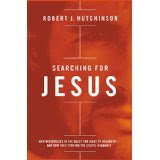 Searching for Jesus by Robert J. Hutchinson is a very detailed read. The text is 275 pages, not including the acknowledgements, selected bibliography, notes, index, or “About the Author” page. The notes are extensive, adding up to 41 pages. The total page count is 350 pages. The book is interesting. The main thrust of the book is to show how (to borrow some phrases from the subtitle) “new discoveries in the quest for Jesus of Nazereth” mainly “confirm the gospel accounts.” The book takes as its main task to argue that “many of the ‘scientific’ or scholarly ideas about Jesus paraded in the media every Christmas and Easter are increasingly obsolete, based on assumptions, theories, and unproven hypotheses that are, in some cases, more than a century old and which have been superseded by more recent research” (p. xvi, emphasis in original). Rather, Hutchinson argues, “new discoveries are causing some experts to wonder if the basic portraits of Jesus in the Gospels is far more plausible than the elaborate reconstructions created by academic skeptics over the past 150 years” (p. xvii, emphasis in original). Throughout the book, the author tackles the most prominent issues surrounding Jesus of Nazareth, examining the evidence to try to see what it shows us and what the best view of Jesus is based on that evidence. Chapter 1 tackles the question on whether or not the gospels contain eyewitness testimony. Chapter 2 looks at the arguments that the Jesus we have come to know is primarily based on legendary material and developments rather than historical facts. Chapter 3 asks whether the gospels are forgeries that have a late date or whether they actually date earlier than previously thought. Chapter 4 looks at archaeological finds relating to Jesus and the New Testament. Chapter 5 asks whether the idea of the Messiah as someone who would suffer was invented by the Church, or whether it dates back to Judaism itself. Chapter 6 examines the Jewishness of Jesus. Chapter 7 looks into whether or not the gnostic views of Jesus are accurate. Chapter 8 asks if Jesus was a revolutionary in line with the Zealots, or whether His revolution was something entirely different. Chapter 9 examines ideas from the Gospel of Judas, specifically whether the view that Jesus planned His own death is accurate or not. Chapter 10 examines what proof we have of the resurrection, and what it meant for Jesus to be resurrected. Chapter 11 looks at how early in the history of Christianity the idea developed that Jesus was divine. Because he covers so many topics, he cannot dig as deep as could be done into any of them, but he does a great job of giving a broad overview of the issues from multiple perspectives, ultimately arguing in favor of what the gospels seem to say. Throughout the book, Hutchinson lays out all the various perspectives related to the issues above. He doesn’t merely argue for the conservative, orthodox views. He also clearly (and fairly) explains multiple views that would traditionally be considered liberal and skeptical. Which leads me to the concern I have with the book. As it is published by Thomas Nelson, I honestly think I went into the book expecting something more traditional and conservative. In reality, the book, while mainly conservative, tends to be more open to liberal arguments than what I am used to reading. From what I can tell, nothing on the back of the book or inside flap led me to believe that the book would be written that way. An endorsement from N. T. Wright on the back says that “[q]uestions remain,” but it never mentions what kinds of questions or how many we should expect. The inside flap does say the book is “Written for skeptics and believers alike,” but many conservative apologetic works make that claim. Once I started reading the book, however, it quickly became apparent that this was not a standard apologetic work. To me, something this clear should have been included on the dust flap or the back of the book rather than tucked away inside the introduction, especially since this book is published by a company that, to the best of my knowledge, is usually known for quite conservative and orthodox books. People just getting into apologetics could pick up the book thinking they are getting something along the lines of Strobel or Geisler, when in reality, this book is far different. The author goes on to explain how he struggles with the same skepticism as non-Christians, but that he is willing to dig into the evidence of contemporary scholarship to follow the evidence where it leads. I admire this honesty, of course; I just wish it would have been clearer somehow on the outside of the book, which is traditionally the promotional part. Again, no fault to the author for his forthrightness. I just wonder how many people will pick up the book based on reviews or the cover without realizing this is the mindset the author is coming from? So, what is the end result of the author’s writing? What does he leave the reader with in the last part of the Epilogue? This is far from a traditional conclusion to an apologetic book. We have already established, however, that this is not a strictly apologetic book in the usual sense of the word. For conservative Christians, however, who take in hand to read through this book, the ending may come as a shock. While the author doesn’t outright deny the traditional claims for Christ’s life, his desire to take a “middle course” keeps him from ultimately landing on either side, leaving it up to the reader to decide on his or her own. So is this a book I would recommend? Yes . . . and no. Yes, I would recommend the book to skeptics who are open to historical evidence. I would recommend the book to apologists who are interested in keeping up with recent findings in New Testament scholarship regarding the life of Jesus. I would recommend this book to anyone who has already read and is familiar with the liberal and conservative arguments regarding Jesus of Nazareth. But no, I would not recommend the book to new believers. I would not recommend the book to someone interested in only a conservative, orthodox defense of Jesus of Nazareth. There are other books that are better for that. So how do I rate the book? In terms of what it is intending to do, to clearly lay out multiple explanations for who Christ is based on current New Testament understanding and scholarship, it does a great job. In terms of showing how recent evidence is pointing us closer to what the New Testament gospels have said all along, it succeeds. Unfortunately, the “packaging” of the book from Thomas Nelson seems to leave something to be desired. The outside of the book can easily lead someone to believe the book is something that it isn’t. It seems like a traditional apologetic book on the defense of Jesus of Nazareth against liberal and skeptical views. While there is some of that in the book, there are also more times the author concedes liberal views than what many Christians are used to reading about. Again, I don’t fault the author of the book for being forthright in his views. I just think it should have been clearer on the outside of the book. Ultimately, this book is good for those I mentioned above, those who are familiar with the discussion and want to read more recent information on it. But I wonder if it wouldn’t have been more successful if published by another company or if the outside was clearer? I fear that skeptics will avoid the book because it is published by Thomas Nelson, a known Christian publisher, and because the outside of the book seems to describe it almost as a traditional apologetic book, or at least it doesn’t clearly explain that it is not. Since the author’s stated purpose is to reach skeptics, I wonder if he will succeed this way. On the other hand, I fear some Christians who have never been exposed to liberal or skeptical arguments may have their faith shaken up, if this is the way those arguments are introduced. There are other books that do a better job of refuting those arguments and introducing them in ways that don’t sound as if they carry more weight than they sometimes do. So there is the potential for confusion to be brought in to some people who the author ultimately wants to strengthen. In short, the book is one I would recommend, with certain reservations, to certain people. But I could not necessarily recommend this book to just any Christian reader without making sure they have resources or people to help them wade through the contents.